Welcome to the world of drive.web! 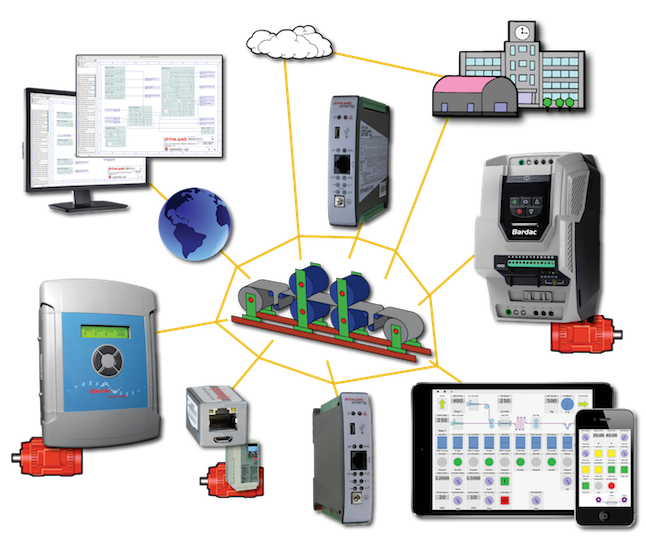 is an entirely new Internet accessible distributed control technology for machine or process controls. 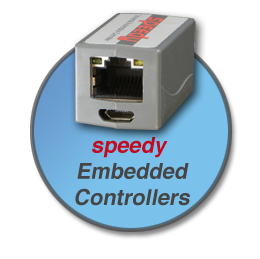 It uses TCP/IP over Ethernet to provide robust connectivity between drives, remote i/o, PLCs, operator stations and SCADA systems. It incorporates a powerful library of drive control function blocks for a wide range of applications such as PIDs, winder controls, position controls, drive coordination, arithmetic, logic, etc. It is infinitely scaleable and the distributed control concept ensures that it is cost effective for systems of any size or complexity. provides a completely homogeneous and seamless environment for control systems. 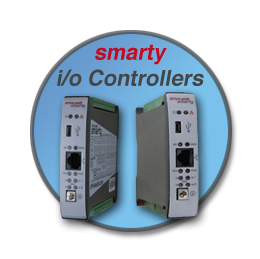 Full featured, programmable controllers that provide i/o, communication gateways and distributed control over Ethernet. 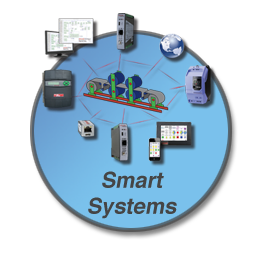 Tiny, full featured, programmable controllers that can easily be embedded in devices such as drives, controllers, HMIs, sensors, etc., to provide "smarts," communication gateways and distributed control over Ethernet. 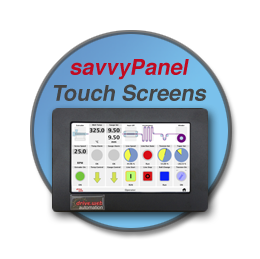 Smart HMIs with machine graphics and operator interface. Also runs on iOS, Windows, Mac OS X, and Linux. A multi-user tool that provides everything you need to configure devices (drives, controllers, HMIs, etc. ), design systems, perform diagnostics, create system documentation, and acquire and analyze system data. drive.web devices (speedys & smartys) connect peer to peer over Ethernet for a completely homogeneous control environment. drive.web devices provide full featured programmable control functions. There is no limit to system size or complexity. ALL system configuration data and touchscreen display information is stored in the drive.web devices - everything! Every facet of your system is easily accessible from anywhere. of drive systems using the intelligent, intuitive savvy software tools. option provides clear, intuitive system views and documentation. 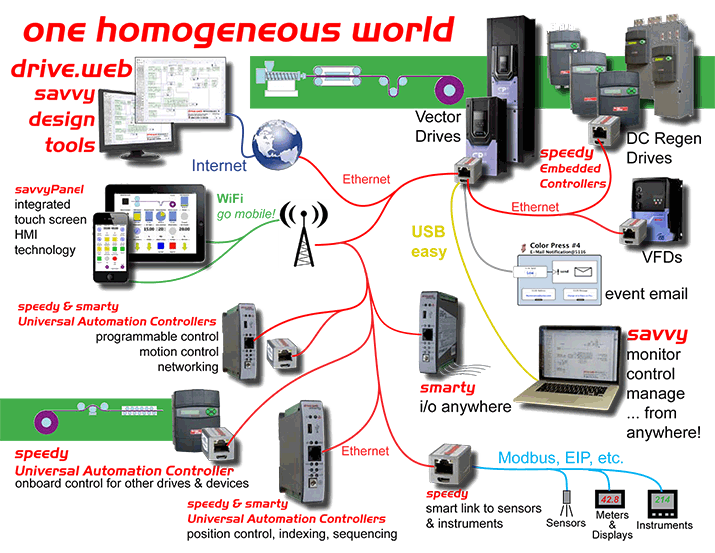 to drives and systems for remote configuration, monitoring, diagnostics and training. from any location can have concurrent real-time access to drives and systems. such as winder controls, PID controls, position controls, drive synchronization, arithmetic, logic, etc., are used to build system functions of unlimited complexity. even with very large networks of drives and controls. is used to provide networking of drives and controls. run on any computer OS that supports Java. provide high performance links between drives, PLCs, Operator Stations, SCADA computers and other control products. makes easy connections between drives, control devices, and software function block parameters. enables users to easily select key monitoring, control and connection points in a large system and “dock” them in convenient windows which can be saved. The “dock” concept aids the organization and documentation of complex systems. capability enables users to drill down into detail layers in drives and system processors and to search, jump and browse anywhere in the system for easy visual system comprehension. enables parameter values to be tracked graphically over time. for secure Internet connectivity is supported in addition to direct Internet addressing. is provided for drives and devices as well as the savvy tools. in savvy provide different user levels for Admin, Engineer, Operate and View. on RS485 ports provide low cost for interface to drives, Operator Stations, PLCs, etc.